“C’mon Gog, wake up! You don’t want to be late for your day at the blacksmith’s shop!” Gog’s father Rogar, a strong and sturdy human, stood over his bed. It was before sunrise, and Gog was still tired, but he was excited enough about his day that he jumped out of bed. As he hurried toward the kitchen table for breakfast, he knocked his father’s broadsword off its display stand on the wall. The sword clattered to the ground, and Gog’s father looked at him sternly. “Be careful, Gog!” he said. “Sorry.” Gog knew that the sword was very important to his father. He kept it on the wall as a reminder of his days as an adventurer. Those days were behind him, though. 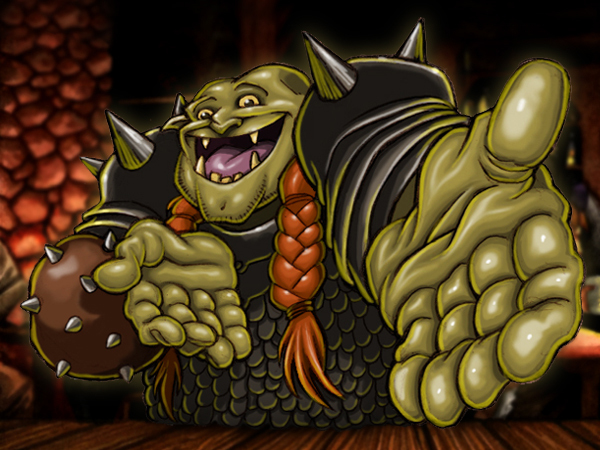 Age had slowed Rogar in a way that goblins, dragons and demons could not. “Gog ready to go?” asked his mother Lor, a large ogre who was nearly always smiling. “Yes!” answered Gog enthusiastically. About once a month, Jarrod the town blacksmith invited Gog to help him for the day. He taught the young half-ogre about blacksmithing techniques and let him swing the hammer. Jarrod also showed Gog the weapons and armor he made, and told tales about the adventurers who used them – including Rogar. Gog loved his time at the blacksmith’s shop – even the farming implements that Jarrod spent most of his time making were fascinating to him. He thought that it would be fun to be Jarrod’s apprentice, but part of him longed for the kind of adventure Rogar had told him about over the years. Gog was nearing adulthood, and had grown to be almost as large as his full-ogre mother. Unfortunately, this made some of the townsfolk aloof and condescending towards him. Not everyone liked the idea of an ogre living among them. Many could not accept the idea of a marriage between a human and an ogre, and this disdain sometimes spilled over onto the product of that marriage: Gog. Gog lived with his parents on the outskirts of Blue Creek, a small but thriving farming town with rolling hills, beautiful scenery, and fertile lands. Although not everyone accepted him, his upbringing was happy thanks to loving parents and enough friends to assure his family that no, they would not be run out of town with pitchforks and torches in some kind of unexpected non-human purge. Gog ran to town and arrived at Jarrod’s shop just as the sun came up. “Good morning, Gog!” said the blacksmith, beaming up at the large young half-ogre. “Good morning!” replied Gog enthusiastically. Gog walked over to where Jarrod was standing. Mounted on the wall was a gorgeous sword – a long broadsword with a jeweled hilt and elaborate designs etched on the blade in gold. “It took months, but it’s done at last,” said Jarrod proudly. “Yes, a local noble ordered this work.” He leaned toward Gog conspiratorially. “And he’s paying me quite well for it!” He slapped Gog on the back and laughed jovially. Gog couldn’t help but laugh, as well. “Show Gog how make pretty swords!” Gog exclaimed eagerly. The annual harvest festival was a few days later – Gog’s favorite time of year. Several years ago, he had caused a bit of a ruckus during the livestock races by jumping onto the track and running alongside the cows. Many of the townsfolk were aghast at this, but Gog’s parents were mostly just amused. This year, Gog had offered to help Jarrod with his work at the festival. The blacksmith had given Gog some horseshoes to deliver to the folks in charge of the cart-pulling contest. Gog was hurrying back to the stand Jarrod had set up. In his overeager state, he stumbled over a stone in the road and fell to the ground. A small crowd of kids about Gog’s age were nearby and started laughing cruelly. “Can’t stay out of your own way, eh ogre?” jeered one. “What’s big, green and dumb? Gog!” shouted another to howls of laughter. Gog stood up and brushed himself off. He burned with shame and anger, and a part of him wanted to just give in to that fury and punch a laughing face or two. But he knew that was wrong, and would cause many more problems than it would solve. Instead, he turned and walked off toward home, their laughter echoing in his ears. The path home took Gog through the center of town, and he was surprised at how quiet everything was – the whole town was at the festival, after all. The unusual silence left Gog alone with his thoughts. He gazed at the ground and thought back to all the times when the children of Blue Creek made fun of him. He found himself wishing that Blue Creek was deserted and quiet like this all the time. His reverie was interrupted by a loud clattering noise coming from Jarrod’s home, nearby. “You idiot! You’ll alert the whole town!” hissed a voice from inside. “No I won’t. The whole town’s at the festival!” said another. Gog knew that something was wrong. He snuck around the blacksmith’s house to the shop behind it. The door to the shop was open, so he went inside. Things had clearly been disturbed. Gog knew what the shop was supposed to look like – and this wasn’t it. Drawers were open, tables and chairs were overturned, and the place was generally a mess. Gog looked toward the wall holding the elaborate sword Jarrod had made. Gog hurried out of the shop and arrived back at the street just as two tall, thin men were coming out of Jarrod’s house. Both had packs on their backs that were loaded up with valuables. Strapped to one man’s pack was the elaborate sword the blacksmith had just completed. Gog was outraged. Seeing the large half-ogre and clearly being in no mood for a fight, the thieves ran. They darted around a corner to an alley behind the butcher shop. Gog followed, nearly taking out the shop’s awning with his head as he lumbered past. The thieves turned again and found themselves in the town square – a large empty space with nowhere to hide. “Let’s just get out of here!” shouted one thief to the other. They headed straight out of town, but they failed to take into account that this path led them close to the festival grounds. Gog continued chasing after them and noticed that they seemed to be slowing down ever so slightly. Gog was barely winded, so he had plenty of energy to shout “thieves!” several times at the top of his lungs. Many of the festival-goers pointed at the sight, and it wasn’t too long before half the town of Blue Creek was watching Gog gain on the thieves as they ran along the road leading out of town. Blue Creek’s constable and several of the town guard took off toward the scene, but their effort was unnecessary. As they started running, they watched Gog make a flying leap and tackle both thieves to the ground. One large-fisted punch to each thief’s terrified face was all Gog needed to knock them out. “What the blazes is going on, Gog?” asked the constable breathlessly when he arrived on the scene. Most of the assembled townsfolk joined in the cheering. Gog noticed that even a few of the kids that had just made fun of him were now cheering along. Gog smiled proudly. As the constable led the thieves off in chains and the crowd dispersed, an older gentleman wearing dark robes and a tall man with pointed ears and colorful clothes walked toward Gog. The robed man had a gray beard and a serene expression. The man with pointed ears had a lute strapped to his back. A small white rabbit bounded into the robed man’s arms. Gog thought that they looked very unusual – nothing like the typical folk he saw in Blue Creek. “Hail, good sir ogre! Well met!” exclaimed the pointy-eared man enthusiastically. Gog stared at the pair, slack-jawed and confused. “That means hello,” said the man in dark robes. “Your strength and stamina are quite impressive, good sir Gog,” said Fleck, smiling at the half-ogre’s lack of pretense. “Gog is strong,” said Gog matter-of-factly. Gog looked confused again. “Leave Blue Creek?” he asked. Gog was conflicted, but also excited by the possibility of being the kind of adventurer he had heard about in stories – an adventurer like his father. Gog furrowed his brow in concentration. “Gog was very excited about being in the big city, as I recall,” said Rogar, smiling up at his son.